Be Your Own Kind of Awesome! I was discussing a situation at school once with someone who probably does not want to be identified here. (I apologize for the mysterious nature of the opening, but I stole this person’s idea and I don’t want to pretend to take creative credit. And they would prefer I not use their name.) There were two school organizations (names have been changed to protect everyone’s self esteem.) So, let’s just say that the Future Bird Watchers Club had been a Big Deal for awhile and a lot of students came out for the meetings after school. They had community projects and other chapters of the Future Bird Watchers Clubs all over the state were somewhat jealous. In the same school the Future Architects had a small but loyal following. FA members did well in school and they had actually had several alumni who were successful in the field of architecture, a fine record by any measure. I was cool about it, but inwardly I was thinking, “That’s a great way of saying it.” I could probably end this post right here. Be your own kind of awesome! Feel free to stop reading now. But it seems like there is more to say. I know many of us have tried to keep up with the next guy. (OK, I have done this. Is there anyone that has not? Perhaps some have escaped this.) This seems to be a very human thing to do. It is a waste of time, especially on the personal level. We always seem to know this when we see others do it. I would imagine we know when we do it too if we take time to consider it. Emulating a successful person can be helpful, to be sure. But you will have to attack life in your own way regardless of where you get your inspiration. It is just a sad thing to watch when it happens. During my teaching career it was at times oddly amusing when I saw middle school students repeatedly making the same mistakes year after year. Middle School students will copy the wardrobe and hair style of the alpha males and females in their school. Adults generally know that some clothing, makeup, and hair styles look good on one person but not on another. So the fashions that work well for the alpha female make some of the other girls look a little foolish. (Same for the guys, to a lesser degree.) Most people learn, eventually, that they are themselves and not someone else. 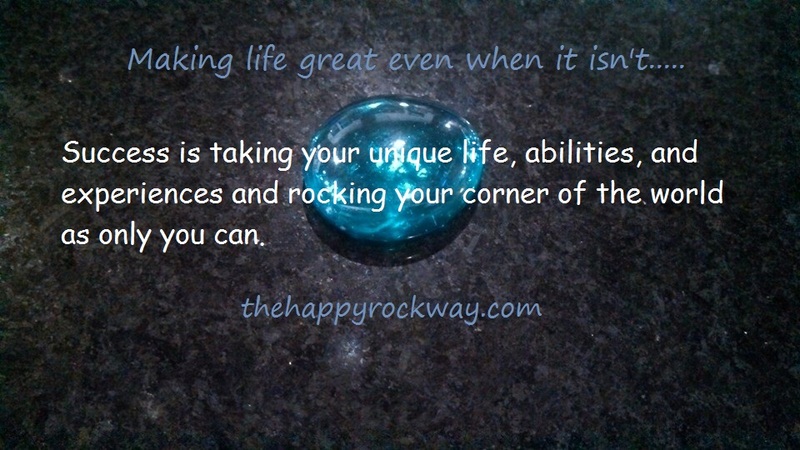 The Happy Rock Way is about learning this sooner and deeper. My Aunt Esther was one of the most successful people I have ever known. She was educated as a nurse, but her profession was co-managing a farm. (Some call this profession “farmer’s wife”, but that really misses the point.) Uncle Bill was in poor health with MS for many years of their marriage. They never had children. But she achieved a level of personal contentment that I have rarely seen. She seemed to have achieved true mastery of the world around her. Having no children of her own, she borrowed her nieces and nephews to help in the summer and managed their efforts with a skill that would impress any corporate manager. We met at her house to divide her household goods on her passing, per the request in her will. The executor, from the local bank, was surprised and relieved about the orderly way we developed to do this. But Aunt Esther’s rules (we all knew them perfectly well) were still in effect. We had a great time. And I truly appreciated her wisdom in causing us all of us to gather together at her place one last time. Her farm was not luxurious and was somewhat run down. The cousins speculated that it would not bring much when auctioned. But, oh, the natural beauty of this property, which was situated west of Enid on a hill over looking a series of spring-fed ponds, was astounding. The string of ponds had once been a seventeen acre lake, but the earthen dam was in poor repair. I was looking down on the ponds from the front yard of the farm house and watched a raft of ducks fly in and land feet first in the pond. Just like in the nature video. And I figured if the right person came to the auction that this beautiful location which really did not look like northwestern Oklahoma would fetch a premium. And it did. But to my Aunt it was just home. Aunt Esther seemed to fit in her world like a hand in a tight glove. She was at peace in life and death. She loved God. She loved her family. She was full of wise statements if you were paying attention. Aunt Esther was her own kind of awesome. She defined the terms of her success and her definition worked for her and for those around her. I suppose an alcoholic could define success as being drunk as much as possible. But that is not quite it. When viewed in this manner, success is not about societies’ definition of wealth or power. Success is taking your unique life, abilities, and experiences and rocking your corner of the world as only you can. Sure, I know people that I from time have something in life that I would like to have. It takes far too long to realize that I would NOT trade everything I have for everything they have. And life is more about everything than it is about any one thing. It is wonderfully complex and varied. It is lying besides the still waters and walking through the valley of the shadow of death. Life will teach you a few things if you are ready to move and learn and grow instead of getting stuck under the circumstances. I seem to see a lot of people these days whose life has really come off the rails. Nothing is moving forward for them. College was supposed to happen. It didn’t. Family support seems to have disappeared. The love of a lifetime turned out not so be so. The college degree didn’t lead to the expected career. And more. For those who feel like they are indeed stuck, consider why this is so. I have at times sought the counsel of others who I considered wise and helpful. If this had not worked, I would have sought a professional counselor I could trust. If if you are mired in a life that is not working please consider doing this. I have had some success as a friendly life coach. Contact me if you want. I have enough sense to tell someone when they really need to see a professional. I have one friend that calls the professional the “therapist” and me the “shrink.” Maybe it helps to have both. But do seek a way out of your dilemma. “There is no failure except in no longer trying.” – Elbert Hubbard. Keep seeking and have faith. Now, some practical tips to go along with the pep talk. Here is the best I can do to explain at this point in my life: We must continually seek to be a better version of our unique selves. If you are a Christian person you can consider the parable of the talents. If not, you can just trust me that life is more fulfilling if you make the most of it. This seems like a simple idea on the surface, and perhaps it is. But if you accept the challenge you will find there are plenty of adventures to be had, as well as times of heartache. You will, with the help of Providence, be on the road to becoming the unique and awesome person you were meant to be. You may not have riches or fame. Or maybe you do. But one thing you will have is a large sense of achievement and well-earned self respect. (Self respect is far more important than self-esteem.) You will have done something no one else could do. You will create something beautiful and unique. Some of these things are going to require you to write some things down. It is important that you do some soul searching and decide what you can and want to do and how you can make that into a life. This isn’t about right answers that will make everyone happy. It is about assessing the life you have been given. It is about deciding how to bring your best to the world in your own extraordinary and awesome way. You will do some things that others can do better. But in the end no one will be able to do and be everything you can do and be as well as you. 1. Take an inventory of things you can do well and that you like to do. Make it a column. Make three. In the second column, put things that you can do well even though you don’t especially like doing them. These are skills you have when you need them. They may help you get where you want to go. But you may not want to get in a position that involves doing things you can do but don’t like and doing them all day long. And make a third column of things that you really really don’t like to do and don’t do very well and would rather avoid when possible. As you are exploring life, this list will help you recognize opportunities as they arrive. You will discover new things. As you confront life’s challenges you will also find that you actually grow in your ability to do some things. Things might move from one column to another. (For me, keeping track of school fundraising money was a huge pain. But I wanted to do as much of it for myself as possible after seeing teachers get in more trouble over the way they handled money than the way they taught. My last teaching year our one fundraiser grossed over $ 14,000 and i accounted for all of it.) Sometimes things seem to appear from nowhere. I have been playing and singing music since I was quite young, but I did not begin the study of the double bass until I was twenty one years old. I had my first original choral composition performed when I was in my late twenties. Your list will vary. Of course. Be prepared to surprise yourself. 3. Learn how to work your own brain! We all think and learn differently. This is a little more challenging, but when you figure out the way you like to do things you will do better. Consider this comparison of great composers. Mozart, who had a phenomenal memory, would write music in his head while doing other things, like taking a walk in the woods. He seems to have been able to edit and replay thing in his head and then play the whole thing back without writing it down. Later he would write it down, perhaps while he was shooting billiards. His original scores were very neat because he was finished with the piece before he ever put it to paper. Beethoven, on the other hand, worked all of his ideas out on paper. It is possible to get an incredible view of his creative process by examining the discarded ideas in his notebooks. (There is a very cool video about this by Leonard Bernstein. He plays things from Beethoven’s notebooks and then shows what the discarded version sounds like when played by an orchestra. It sound pretty good, until you hear the final version, which is amazing. It is really bad video quality, but here it is: https://www.youtube.com/watch?v=yj2-G0RdiOI ) Then there was Chopin. He seems to have written down thing that he played on the piano. His fingers did the composing and then he wrote them down. Which one was right? They all were. They had all figured out how to use their own brains. I took a big step forward in my singing when I reminded myself that I had always sung for fun. Not joy, but actual fun. The more fun I try to have the better I sing. For some, “just having fun” would be a performance disaster. But it works for me. My brain. My way. You find yours! 4. Remember to seek your own definition of success. You get to do this. Take advantage. This is not about trying to do a very little and succeeding. This is about attempting to do something awesome and succeeding. But you get to decide how you are going to be awesome at each stage of life. That’s it for now. I reserve, as usual, the right to revise and extend (or shorten) my remarks.